ON SALE! Save over 50% on StudyMinder and Flash Cards. Get both for only $19.95! Limited time offer. Order now! 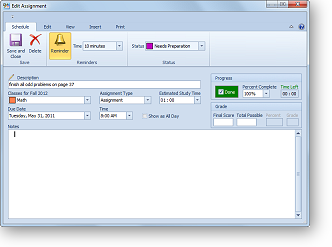 StudyMinder is the essential homework management tool. 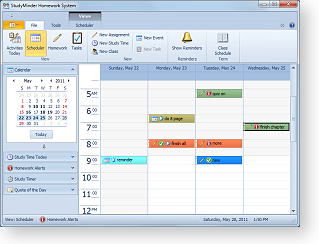 It combines the best features of a student planner and homework organizer into one, easy to use program. The latest version adds a new calendar interface, popup reminders and much more. StudyMinder is designed for students of all ages - from middle school and high school to college level. It's a complete system that helps students develop the study skills they need to get their homework done. Download StudyMinder and use it free for 30 days. There's no risk and no obligation. StudyMinder is guaranteed. If it doesn't help you become a more organized student and improve your grades, do nothing. There is no charge. For a limited time, StudyMinder Flash Cards is Free with the purchase of the StudyMinder Homework System. 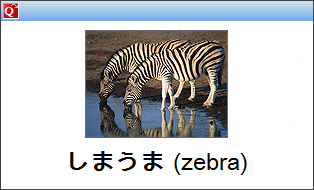 Created with StudyMinder Flash Cards. "I love this software. I am back in school after a long hiatus and was in a total panic over staying on top of my homework. I have to be organized or I freak. Your software has given me a whole lot of confidence. I tried various task managers and none of them had the capability that your software provides." "I love your program. It is exactly what I need to help my daughter stay on task for school." StudyMinder Student Planner © Copyright 2005-2015 StudyMinder Software. All Rights Reserved.